Out My Window: Thursday, A day off for fun! Yesterday, we three girls and mom took a day off. Lil sis took a day from her office. I left the shop with Hubs and we all went out shopping and to lunch. It was a very nice day full of laughs. I tried to spend some money, but mom paid for everything ( weird huh?) Then we went to TJ Maxx and sis had a gift card and as she never shops there she paid for my candle and then left me with the residual card. So even though I paid $16.00 for hair dye and hair supplies, I made up that money in the gift card. Little sis will do my hair and that is a $80.00 savings. I did not go out with this in mind but it worked out that way. Score! I really think mom loves her wheel chair. We are able to go and she was so thrilled, I am also hoping to be able to take her on walks on the levy. Hub's and I like to get out in the evenings and we can take her now. It just gives her more freedom to go and not get so tired. It is also easier on all who take care of her. I have so much to do in the shop today as I have not been very productive this week. Sis and I are also going to clean out the linen closet and make trip to Good will. We are getting rid of clutter and things I do not use. Hoping after I get my sewing done to work on a few projects this evening. We will see. I am beyond impressed that you got your mom in a chair and even more impressed that she is taking to it well. I know it makes life easier for her and for all of you as well. Fingers crossed we also have some successes with Mom. Thanks, yeah I have a story about Hub's dad and flying him back to Gettysburg. He has dementia. Good times. I, too, am glad she is using the chair. When my back was so bad and I kept falling, I used a chair and my world opened up. It truly is life changing - so glad you got some fun girl time! Yes is was very nice. I'm happy your mom is willing to use the wheelchair. I know many who aren't and miss out on living a full life. Great savings on your hair care! I'm currently deciding if I'm going to color my hair or let it gray naturally. Since I'm only 47 it will be a long time commitment. Decisions, decisions. I would have gone grey a long time ago. My husband, however has hair that grows down to his eye brows and he has very little grey, at 67 that is pretty good and i don't want to look like his mother. It is good to hear that your mother can be more active and get out into the world. I wish I had an electric scooter! It sounds like you all had a fun and thrifty day. I am really excited about it. I think it will help her mood. 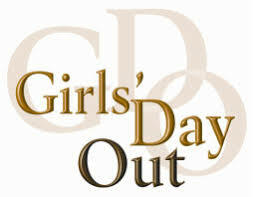 So nice you had a fun day with just "the girls"! You mentioned cleaning out your linen closet and Goodwill. Maybe some if the linens not needed could be used in quilting projects? Just a thought. I actually am giving 2 sets of king sheets and several sets of pillow cases to Hub's nephew. We donated 5 really nice quilts to good will. I just had too many combining mine with mom's. If you ever want to come down and stay I have a nice spare room and bath waiting for you. We can play cards ,thrift shop and eat at Effies! It sounds like a lovely day, and so happy you all encouraged your mom, and she enjoyed it. We found once my mom willingly used her chair for outings, she actually could start enjoying them again. They lived across from a park with a nice path, so we could push her for walks, and even go to my daughters ball games that were at that park. I think once the addition of aids, whether that is hearing aids, walkers, wheel chairs are seen as a way to gain more out of life rather than get bogged down in the stigma, quality of life for seniors really can better. I know that she does not want to be seen in a wheel chair, but once she is over that, her life will open up. I am excited for her. Singing praises for the wheelchair!!! I"m so happy you girls had a wonderful day together. I got my hair colored yesterday... $80 for a basic color and cut. Yikes! I remembered why I had previously decided to go grey ... lol. I am so grateful my Lil sis was a beautician before she became an executive. She does a great job and saves me a ton of money!